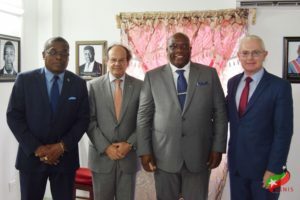 BASSETERRE, ST. KITTS, OCTOBER 7TH, 2017 (PRESS SEC) – Prime Minister Dr. the Honourable Timothy Harris held four back-to-back bilateral meetings today, Saturday, October 7th, 2017, with some of the visiting diplomats who are in St. Kitts and Nevis to attend our 34th Independence Anniversary events, which initially were scheduled for September 19th before the passage of Category Five Hurricane Maria necessitated postponement. Diplomatic representatives from Japan (His Excellency Mitsuhiko Okada), the Czech Republic (His Excellency Vladimir Eisenbruk), Panama (His Excellency Jesus Sierra Victoria) and France (His Excellency Mr. Philippe Ardanaz and French Foreign Trade Advisor, Mr. Jacques Chouraki) paid courtesy calls on the Honourable Prime Minister, respectively. The meetings, which started at 11:00am, took place at Camp Springfield, following the celebratory toast that was held there. 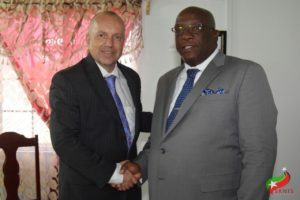 One of the main topics of discussion was the process known as graduation whereby the Organisation for Economic Co-operation and Development (OECD), the World Bank and other international organizations have upgraded St. Kitts and Nevis and other small-island developing states (SIDS) based on their GDP per capita. Graduation makes SIDS no longer eligible for the concessionary borrowing rates they previously had access to and thereby disregards that their GDP is vulnerable, particularly to exogenous shocks such as hurricanes. in the twinkling of an eye, all that GDP amounts to nothing. It can be lost…here, whatever happens happens to the entire country, and so our own vulnerability in our view has to be taken into account in terms of graduation…so that countries like ours are not excluded from concessional sources of financing and we are not excluded from development aid, because that is going to be important if we are going to continue to develop,” Prime Minister Harris said today during his bilateral meeting with His Excellency Vladimir Eisenbruk of the Czech Republic. Dr. Harris repeated similar sentiments in the other meetings. “So we are hoping to get your support,” the Honourable Prime Minister also said to the diplomats who expressed a willingness to assist. 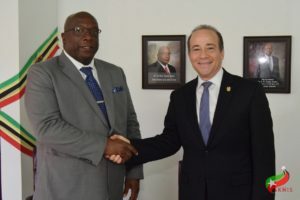 Like St. Kitts and Nevis, Panama is part of the 35-member Organization of American States (OAS). Japan and France are part of the Group of Seven (G7), which comprises the seven richest economies in the world. The Czech Republic, France and Japan are part of the Group of Twenty (G20), which consists of the world’s largest advanced and emerging economies including the European Union. Japan will host the G20 summit in 2019. On December 12th, 2017, the two-year anniversary of the Paris Agreement, France will hold “a new summit on climate mobilization,” as French President Emmanuel Macron has referred to it. 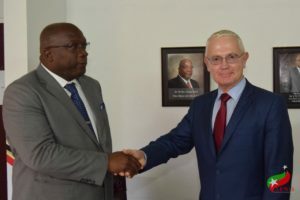 Opportunities for development cooperation in relation to climate change and disaster mitigation and reduction were also discussed during the meetings. Earlier this year, the government of Japan funded the more than US$370,000.00 Nevis Disaster Management Department’s “Enhancing Disaster Resilience and Emergency Shelter Management Project.” The project included, among other things, work on the community centres, as well as rock revetment work at Stoney Grove. 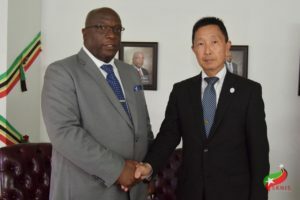 “Minister [Mark] Brantley yesterday told me that those shelters were quite useful for residents to take cover when the hurricanes came close to the island,” His Excellency Mitsuhiko Okada told Prime Minister Dr. the Honourable Timothy Harris.